Chicago is a city that takes great pride in its architectural legacy. For more than a century, the Midwestern metropolis has remained on the cutting edge of design. It is also a city with a great tradition of championships and excellence in every major sport. Chicago fans take special pride in their hometown Chicago Bulls, a team that has had one of the most dominant runs in NBA history. When the time came to build a new state-of-the-art practice facility for the Bulls, it was an opportunity for the architects at HOK to bring the city’s traditions of architecture and sports together. 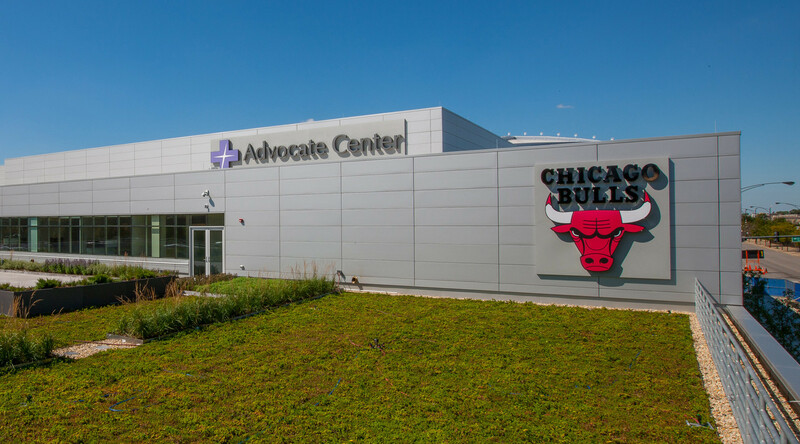 The new practice and training facility, known as the Advocate Center, enhances the adjacent United Center campus, where the Bulls play their games. Inside the facility, players have access to the very best in sports and fitness technology. Among the amenities are two full-sized basketball courts, expanded locker rooms with hydrotherapy pools, a video room, offices, a weight room and more. The Advocate Center boasts embedded technology that collects player data and stats for real-time analysis. Great care has been taken to keep players in tip-top shape while helping them sharpen their skills and prepare for game time. For the exterior, metal weaves the new facility into an already existing design framework. “The use of metal helped seamlessly integrate the building within the overarching United Center campus aesthetic,” explains HOK’s Jon Maxey, senior project architect on the Advocate Center. 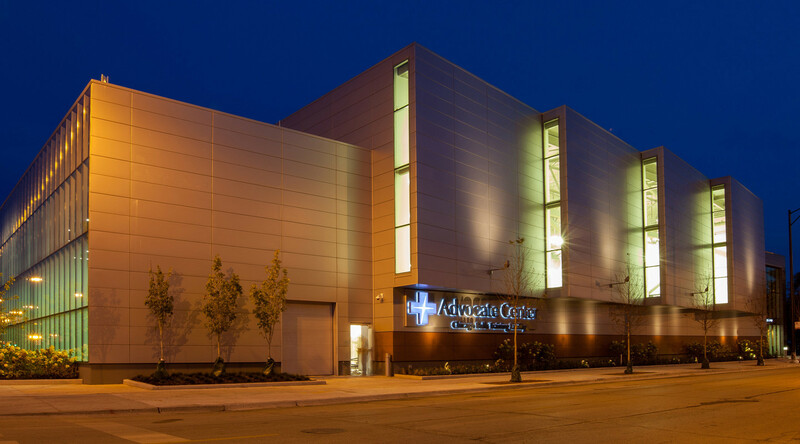 Formawall Dimension Series insulated metal panels from CENTRIA were chosen for the skin of the Advocate Center. The foamed-in-place core of the panels delivers excellent thermal efficiency and moisture control in a single, panelized component. Designers also implemented metal accents in the form of CENTRIA's single-skin Concept Series rainscreen panels and integrated CS Louvers. Achieving the desired aesthetic took a great degree of precision. The design and construction team found the expertise and support they needed from CENTRIA and were able to bring the vision of the facility to life. HOK has a rich and successful relationship with the Chicago Bulls. The United Center was designed by the regional leader of HOK’s Sports + Recreation + Entertainment practice, George Heinlein, and HOK has been involved with updates and renovations to the United Center campus since its construction. Since its grand opening in the fall of 2014, the Advocate Center has been a hit with players and the community alike. It has been an important investment in the future of the Chicago Bulls and has made a significant impact in the redevelopment efforts of the Near West Side neighborhood where it resides. 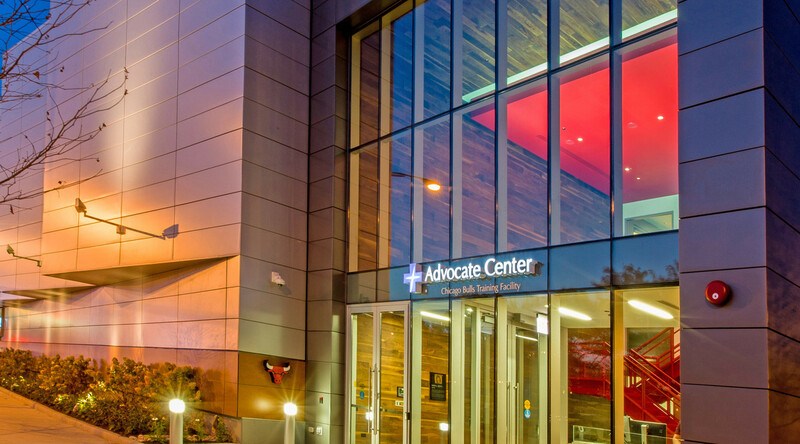 With state-of-the-art design and facilities, the Advocate Center is a great addition to Chicago’s design legacy and a step on the path to bringing another championship home to the Second City.